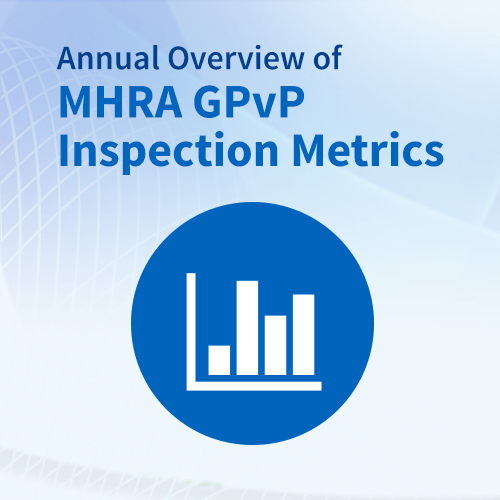 The Medicines and Healthcare products Regulatory Agency (MHRA) recently published their latest Good Pharmacovigilance Practice (GVP) Inspection metrics covering the period April 2015 – March 2016. Within this period a total of 35 inspections had been carried out, compared with 47 in 2014-2015 and 56 in 2013-2014. The report provided some insight into the focus of the MHRA GVP Inspectorate and how the industry is adapting to and implementing the revised GVP legislation that has been in place since June 2012. A change in some of the categorisations of findings does not enable a direct comparison to previous years, but a comparison of the general outcomes can be made. The majority of Critical findings were in the area of Marketing Authorisation Holder (MAH) Supervision and Oversight (28% of Critical findings) which included issues with the content and maintenance of the Pharmacovigilance System Master File (PSMF) and Qualified Person for Pharmacovigilance (QPPV)/MAH oversight of the Pharmacovigilance (PV) system. This category was not in place in previous years, however the category “MAH Oversight” had no Critical findings in 2013-2014 and 11% in 2014-2015. In previous years, the maintenance of the Reference Safety Information (RSI) had been the most frequent source of Critical findings, but this area was the second highest in this latest report with 18%. In 2014-2015, the maintenance of the RSI contributed to 29% of Critical findings and 42% in 2013-2014. This represents a positive downward trend in Critical findings against the RSI. Data management also resulted in 18% of Critical findings and as stated by the MHRA in the latest report “included issues with collation and integrity of the global safety dataset, ICSR handling and safety database validation, configuration and control”. There was no such category in previous periods. The area of Signal Management had seen a significant increase in Critical findings in 2014-2015 (26%) from 2013-2014 (11%), but in the latest report, Signal Management accounted for only 9% of Critical findings which indicates a positive trend for this area. There were also no Critical findings against the topics of Periodic Safety Update Reports (PSURs) and Quality Systems, which had Critical findings in each of the previous two metrics reports. There were also no Critical findings against Risk Management Systems. This is a positive outcome for these three key areas of the PV system. Regarding Major findings, there was less positive news on the topic of the Quality System with an increase in the proportion of Major findings from 11% in 2013-2014, 14% in 2014-2015 to 24% in the latest report. As there were no Critical findings against this area in the current period, there is possibly some mitigation regarding this trend in Major findings, in that the number of findings may not have significantly reduced, but the issues identified in the current period were of a less serious nature than in previous years. The only other significant trend is the increase in Major findings against the PSMF from 6% in 2013-2014 and 4% in 2014-2015 to 11% in the latest report. In summary, the latest MHRA GVP Inspection metrics reports has provided some insight into the challenges the pharmaceutical industry continues to face in certain areas of PV. MAH Oversight and Supervision and particularly the implementation and maintenance of the PSMF have contributed to an increase in Critical and Major findings in this area. Some more positive news, however, is the decrease in Critical findings across a number of key areas including the RSI which historically has consistently contributed to the highest proportion of Critical findings, the Quality System, PSURs and Risk Management Systems. MAH seem to be adapting to the revised 2012 legislation and the change in focus in certain key areas of the PV system. Some of the new topics implemented in the 2012 legislation, however, continue to provide challenges. To enable continuing improvement and to address the challenges described above in a proactive manner, auditing will continue to be a powerful tool at MAHs disposal to periodically review their PV system and that of their business partners and service providers. Implementing a systematic, risk-based auditing plan and schedule not only ensures compliance with GVP requirements but helps MAHs to identify and address any concerns and non-compliances. This will help to ensure a robust PV system is in place with patient safety at the forefront and reduce the risk of significant inspection findings.